Lots of excitement on this Monday… let’s dig in, shall we? An Antepenultimate Wager in a Millard Fillmore category? I was pumped – but Greg killed my excitement with his bet. I take that on in my video. 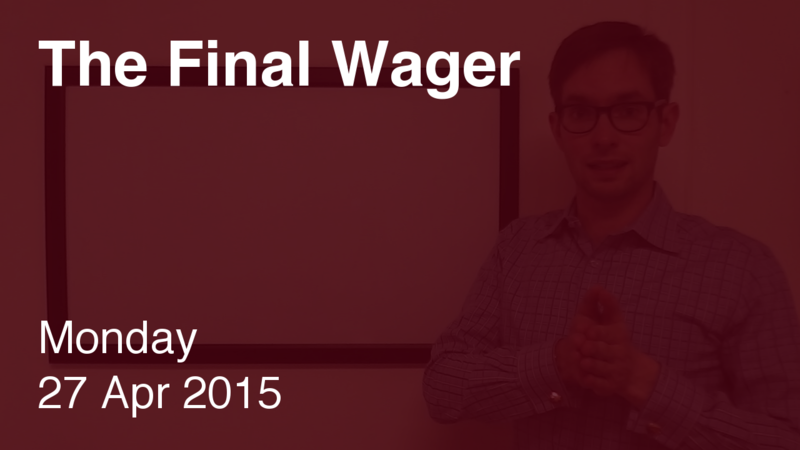 His lowball wager notwithstanding – and with a little help from a miss by Tim on the last Double Jeopardy! clue – Greg has a commanding lead. Tim, Tim, Tim. He has a much better wager to preserve second place: 13,000. It puts him ahead of Greg’s pre-Final total if he’s right. This is the Weak Form of Shore’s Conjecture. I don’t usually analyze this, because no player with a shot at the win should ever play for second.